How do people see disability today? Some time ago, people’s idea of disability was very distressing, especially towards people with disability and their families. If a child was born with any kind of disability, they would attribute that to many strange taboos, spiritual and traditional beliefs. The person would be seen as an object of pity, tragedy, and misfortune. In some communities of the world, they would have charity events, fund-raising events, spiritual and deliverance services for people with disabilities. Sadly, some places in the world still see disability in that light. Today, disability is seen very differently, even though many people have still not come to terms with it. Education, information, support services, policy and accessibility efforts by many modern societies have empowered people with disabilities, together with their families, to rise to their fullest potential. Children with disability are able to go to school and feel part of society. Many people with disability have grown to become great, successful people. Ray Charles and Steve Wonder, both blind from childhood, are some of the greatest musicians the world has seen. Marlee Matlin, who lost her hearing from childhood, is a great Standup Comedian and Actress. Chris Burke, a favorite American TV character, and writer, is a person with Down Syndrome. Nick Vujicic is an Australian Christian Evangelist and Motivational Speaker. Born in 1982 with a rare disorder, characterized by no hands and legs, has lived to inspire millions and continue to empower people. He now lives in California USA with his wife. Disability is part of life. People with disability have potential too, just like people without a disability. They have the same rights as everyone else and if people with disabilities, families, and society can work together on policy, we can make society all-inclusive and every person will have a fair chance to be the best they can be. 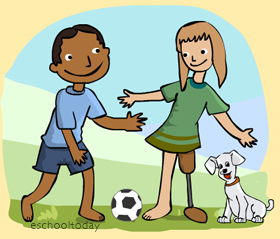 This lesson aims to provide some basic information on the issue and help young people with and without disabilities to welcome each other’s strengths and appreciate their weaknesses. It aims to provide some basic information on what disability is, how to relate to people with disability and stop seeing disability as a devastating condition, but rather see the potential in the person and harness them for their good and the common good of society. Copyright © 2006-20117 eSchooltoday in association with BusinessGhana.com.